Who wrote the first work of science fiction? The answer to that question will change depending on who you ask. Some critics look back to Mary Shelley’s Frankenstein; others point to magazine editor Hugo Gernsback. Some will claim that it reaches as far back as Ancient Greek literature, whereas others contend that it was a reaction to the Industrial Revolution. And the frustrating thing is that all of these arguments have some validity. Most of the surviving Ancient Greek literature feature elements of the fantastic to some degree. Homer’s Odyssey, from the seventh century BCE, is probably the most well-known example, and its description of fantastic voyages through distant lands has certainly influenced subsequent speculative literature. Whether this means that Ancient Greek novels could be considered the first SF texts is a fiercely-contested debate. 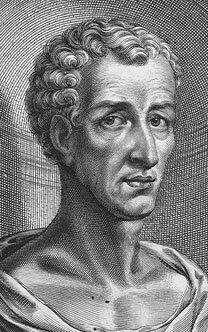 The writer from this tradition who is most commonly associated with SF is Lucian of Samosata, who lived CE 120-90. His texts Ikaromenippos and True History are often cited as proto-SF (a term that I despise for its vagueness). The first of these details a voyage through space after the protagonist attaches wings to his arms. True History is the rather exciting story of a war between the peoples of the Moon and the peoples of the Sun. Lucian of Samosata. Is this man responsible for all of science fiction? Probably not. However, it must be understood that Lucian – and the other Greek writers – subscribed to an Aristotelian cosmology. Not only was Earth at the centre of the cosmos, but the heavens were understood in a purely theological framework. To voyage upwards – whether to the Moon or elsewhere – was entering a sphere that was only understood in religious terms. They were not explored scientifically. These fantastic voyages were predominantly religious fictions, rather than fictions of science. And this is why the next item on this list has a much better claim to be the very first scientific moon voyage. In The History of Science Fiction (2005), Adam Roberts identifies the astronomer Johannes Kepler’s posthumous work Somnium as the first work of SF. And he makes a convincing argument. Somnium was written over a period of forty years, from 1593 until Kepler’s death in 1630. Kepler wrote the work to explain his theories on how the motions of the heavens would appear to an observer stationed on the Moon. He was an early advocate of Copernicanism, in an age when open support of such heresies usually ended with a public execution. Somnium tells the story of Duracotus, who discovers his mother is a witch. She summons a daemon from the Moon, who spends the rest of this short tale explaining the nature of life on the Moon. But the real genius of Somnium lies in the 223 explanatory notes that follow the main texts, as Kepler explores the idea of lunar astronomy in intricate detail, mapping out his Copernican worldview with scientific rigor. By concealing his physics within the framework of a “Dream,” Kepler was able to pass off his work as piece of fantasy. The two halves of the story – the fictional tale of the daemon and the accompanying Notes – are in such stark contrast to each other that it’s difficult to believe they belong to the same novel. Yet this contrast between superstition and science is representative of Kepler’s own religious beliefs, and the broader theological landscape of the seventeenth century. Somnium is a work of modern science hidden behind the guise of mythology. It straddles both the age of superstition and the age of rational thought. And it is somehow fitting that the birth of a scientific speculative literature was concurrent with the birth of science itself. Despite Somnium‘s influence, works of scientific speculative literature were quite sporadic for the next 150 years. John Wilkins and Francis Godwin both wrote stories about moon voyages in 1638; Margaret Cavendish published The Blazing World in 1666. Swift’s Gulliver’s Travels (1726) has sometimes been cited as a pioneering work of SF, but without enough credence (in my opinion) to warrant a separate entry on this list. Similarly with French philosopher Voltaire, whose short story “Micromégas” (1752) is an under-appreciated gem of the genre. It is not until Mary Shelley’s Frankenstein appeared in 1818 that a proper tradition was established. The argument that Mary Shelley’s Frankenstein began the tradition of SF has been repeated so often that it borders on the cliché. Critic Brian Aldiss first advanced the argument in Billion Year Spree (1973) and it’s since gone on to become a staple of the academic community. Aldiss believed that SF had evolved from the Gothic novel – Frankenstein was the perfect launching point for his theory. 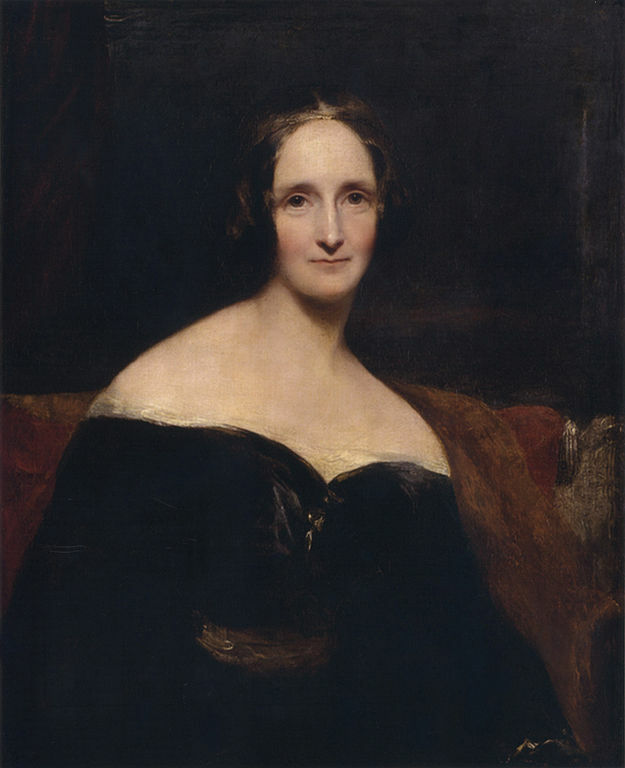 A portrait of Mary Shelley. The nineteenth-century version of a selfie. Shelley’s novel perhaps has the best claim to be the first work of SF. Its understanding of the evolving role of science in society was decades ahead of its time. Most of this was due to Shelley’s interest in contemporary science. The use of electricity to animate the monster reflects the debates of the early nineteenth century about the nature of electricity – whether it was a purely material force, or if it was a fluid that influenced human spiritual existence. Romantic scientists, such as Galvani, believed that electricity was one of the animating principles behind life, but materialist scientists ridiculed this idea. Frankenstein recapitulates this divide without giving primacy to either side; the monster is read simultaneously in both Romantic and materialist traditions. The novel is a cautionary tale about scientific hubris and the dangers of experimentation. It is an examination of the state of knowledge in the early nineteenth century, when a materialistic concept of science was separating from older traditions of natural philosophy. That’s what made Frankenstein such a success – it ambiguously straddles both traditions; a commentary on science itself. Although the birth of scientific speculative literature may have been concurrent with the birth of science itself, it was the nineteenth century which saw a scientific cultural milieu that allowed this literature to transform into our modern conception of SF. And Frankenstein, undoubtedly, sits at the point of that fulcrum. 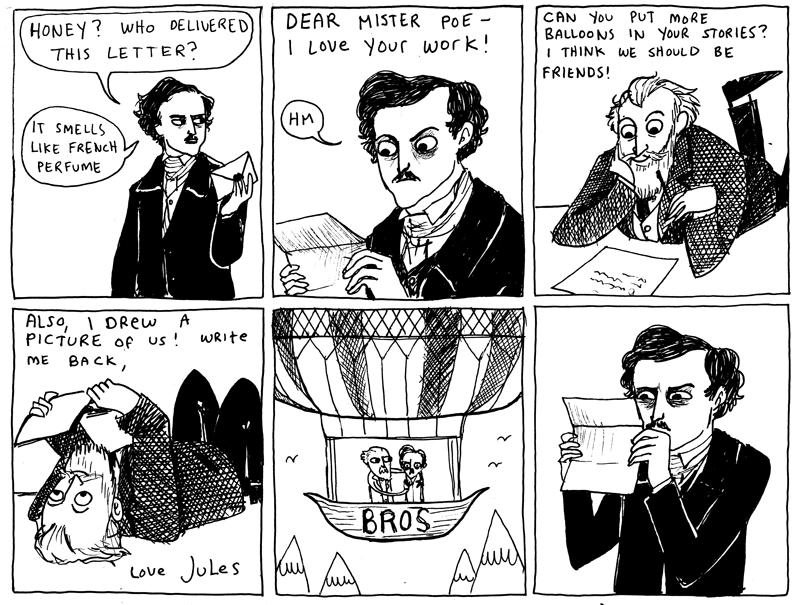 There’s few authors who have influenced as many genres as Edgar Allan Poe. He practically invented crime fiction in “The Murders in the Rue Morgue.” His unique brand of Gothic horror shifted the focus away from haunted old castles to the creeping fears of the human mind. And his SF was cheap and thrilling, written for a mass audience, a mixture of real science and pseudoscience that stirred the public imagination. Poe’s SF is definitely not his best work. His three most interesting works of SF explore the pseudoscience of mesmerism: “A Tale of the Ragged Mountains” (1844), “Mesmeric Revelation” (1844) and “The Facts in the Case of M. Valdemar” (1845). In the 1840’s, mesmerism had shed its occult connotations and was close to being accepted as orthodox science. All three of these stories feature characters who perform stunning feats under the influence of mesmerism. Poe’s prose style is exact and methodical, more akin to a report than a story, inviting the discerning reader to draw their own conclusions. His most recognized science-fictional tale is “The Unparalleled Adventure of One Hans Pfaall” (1835), in which the titular protagonist travels to the Moon in a balloon assembled from old newspapers. It’s Poe’s attention to detail that make this story memorable. The implausible voyage to the Moon is rendered with such scientific exactitude that it elevates the story above it contemporaries. When the story was republished in 1840, Poe added a note that lamented the lack of scientific verisimilitude in the other moon voyages of literature. It was a sentiment that resounded in the nascent genre of SF. Jules Verne and H.G. Wells are often referred to as the “fathers” of SF, yet the two men came from very different traditions. Verne had already published some of his famous novels before Wells was even born. They never met each other, and Verne was famously critical of Wells’s works. Yet, between the two of them, they shaped our modern perception of science fiction, gifting it with many of the generic elements that are still utilized today. Verne’s voyages extraordinaires focused on the relationship between technology and people. A character would journey to an exotic location, usually travelling in some advanced technology that was an extrapolation of the existing technologies of Verne’s era. It allowed the characters to satisfy their colonial desires and return safely to the comfort of their home. His publisher, Pierre-Jules Hetzel, tasked Verne with writing his voyages extraordinaires to compensate for the lack of science education in France’s conservative Catholic schools. Thus a large part of Verne’s writing serves a didactic purpose. His characters utilize science and technology to explore the frontiers of knowledge, whether it be at the centre of the Earth, under the sea, or deep space. Wells pioneered a unique brand of scientific romance. His novels and short stories demonstrate a social awareness that Verne was lacking. But it is his consideration of the implications of Darwinism that underpins the best of his fiction. The Time Machine imagines a society where the class division of Victorian England has become rigidified into the evolutionary schema. The Island of Doctor Moreau revels in the blurred distinction between human and beast. The War of the Worlds postulates a species that is pure intellect, and The First Men in the Moon depicts a lunar society where evolution has been manipulated for utilitarian purpose. Perhaps more than any other Victorian author, Wells sold Darwinism to the public imagination. Could these two authors be considered the first SF writers? Both authors demonstrate a critical awareness of the increasing industrialization of society in the late nineteenth century. Verne’s characters capitalize on that industry to transport them to brave new worlds, whereas Wells’s characters toil and suffer under the social implications of that same industry. They were writing at a time when technology was beginning to radically transform society, not always in a positive way. Many of the threads that constitute science fiction come into cultural visibility in this period, and Verne and Wells are the two authors who best incorporated this into their fiction. 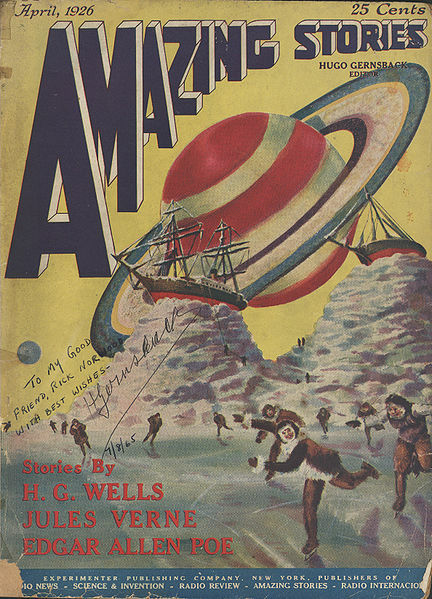 The first issue of Amazing Stories, April 1926. By identifying Poe, Verne, and Wells as belonging to the same tradition, he had created a conceptual framework for SF. He posited a genre which combined Wells’s passion for the social implications of science with Verne’s understanding of the link between people and technology, underpinned by Poe’s mass-market appeal. Within a few short years, a handful of other magazines were also publishing tales of SF, and the genre had found a home in the lucrative pulp market. However, it wouldn’t be until John W. Campbell, Jr. took over as the editor of Astounding in 1937 that it gained some respectability. Gernsback was also instrumental in creating SF fandom, by publishing the addresses of the people who wrote to his magazines. Fans were then able to mobilise themselves into something of a coherent movement. 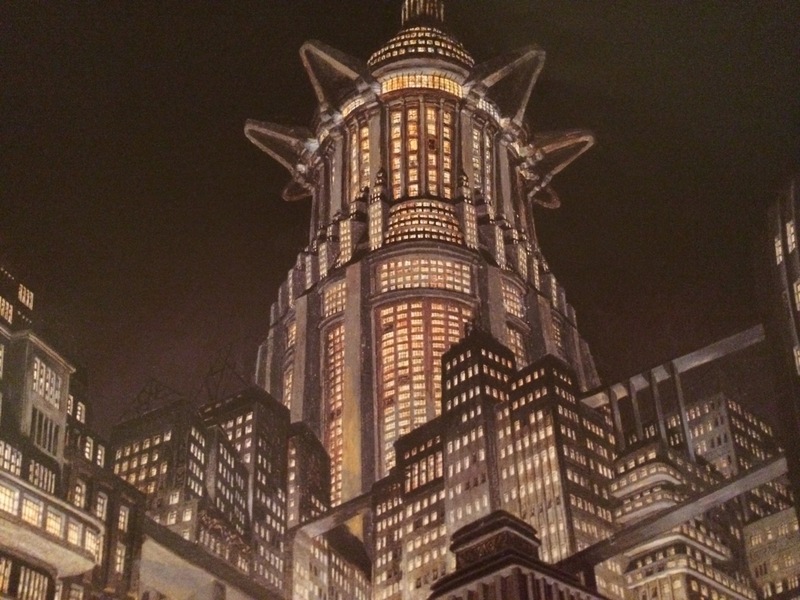 Critics are divided over Gernsback’s influence over the genre: some celebrate his initiatives, but others lament his focus on didacticism. He also wrote the novel Ralph 124C 41+, which is full of ideas and technologies that would later become staples of the genre, but unfortunately suffers from a terrible prose style. So which one of these theories deserves precedence? Let’s get academic on the nature of what defines a genre. A historical approach to genre theory contends that there cannot be a single origin point of a genre – an urtext. There is no single piece of SF that encapsulates – much less anticipates – the many-headed hydra that the genre resembles today. Instead, it is easier to think of a genre as a slow accumulation of resemblances, as different strands come together into a common tradition. A text can only be identified as generic when it demonstrates a repetition of the themes, tropes, or stylistic qualities that have been established in previous texts. So it is impossible to distinguish a singular starting point. Rather than looking for a single urtext, it is perhaps better to look for the emergence of the threads that would eventually coalesce into SF. And that’s what these six starting points represent – six different threads that would eventually form the modern genre of SF. Each one of them contributes something essential to the genre, and SF wouldn’t be the same without them. Previous Post: The Future of Spaceflight?